If you’ve ever seen the movie Glen Gary Glen Ross, you’d see a strong precedence of how the public thinks of real estate professionals. Pushy, two-faced, actors who treat their customers like idiotic pawns. The information age has nearly obliterated the old-school style of networking. If someone is looking to sell, buy, wholesale, or short sale, looking for qualified professionals in their area is a point and click away. Given, those who have been marketing to (that) segment may have a shoe-in, but often times prospects will be talking to 2-3 other people they think may be able to assist their situation. You may have taken months to develop a relationship of sorts with a prospect, but if a better option comes along for them, they can be gone in an instant. If you were able to find them, in all probability, so were other competitors. The information is so readily available that you need to have a plan in place to attract and close customers in a timely manner, softly reminding them constantly of all the benefits you offer. No matter how many degrees you have, houses you’ve closed, funds you’ve issued, etc, the customer only cares what’s in it for them. Treat them like you KNOW they have options, you’re grateful for the opportunity to earn their business, and if they choose you they’d have a wonderful experience with you and your company. Reflect that in your marketing, conversation, and closing pitch. On the tail of the last point comes the fact, you’re easier to find out about these days. If there’s not much to see about you online, or otherwise, that may be a turn-off for customers, as well. Even if it’s a Facebook Business Page, it’s important you have something. If you haven’t already, for God’s sake, put up a web page. It doesn’t have to be fancy, but it is the bare minimum online store front for your business. Brandon Turner wrote a wonderful article on this very subject, if you’re still intimidated by the idea. Secondly, Google yourself and see what comes up. Most likely, your LinkedIn profile, various social network profiles, and any articles that contained your name will come up. Check for reviews, feedback, customer service complaints, and things of these nature. A buzz, for better or worse, may have started about you online, and it’s important you monitor what’s being said. It will and can attract and detract future customers. Don’t have a buzz, yet? Ask previous customers to write reviews on Yelp, Google Places, or even a simple email so you can post the testimonial online. You may promise the world to prospects, and be able to deliver, but people flock to the internet to check you out and read reviews about you to make their purchasing decision. Give them something to latch on to. Even if there’s negative feedback, address it in a professional manner and leave it up. All business’ face criticism or unpleasant customers, and it can be a wonderful example of how you handle conflict. Realtor.com recently shut down an experimental algorithm-based tool that would ideally match up a customer with the perfect real estate agent for them, based on amount of sales, listing days on market, and other public data. This performance-based tool, AgentMatch, excludes information that can’t be found online, like off-market deals, or interpret between the lines of numerics. It has agents in an uproar, but, there is a gap missing for customers to get a full overview of their real estate professionals’ performance and capabilities. Point being, big data may be forming an opinion of you in the near future, so beat them to the punch to showcase your talents, satisfied customer base, and volume. Got the time and customer base? Take a small camera and record 30-60 second testimonials from prior and current customers and post them on your website, social networks, etc. Videos go a long way for making an impression, so make it a goal in 2014 to at least post a handful of video testimonials to vouch for your company. If you’ve ever worked in a restaurant, or similar customer-based environment, it’s much easier to understand the idea of a “customer-first” mentality. Practicing and perfecting a confident sales style, backed with a top-notch customer service from you and your staff, will go a long way as the internet continues to sandwich your efforts with reviews, feedback, and exposure. What do you think? Consumer debt: Many of us have it. And most who do, have a love/hate relationship with it. If you can't make the purchase with cash, do it with debt — right? We love to know we can still consume, but we hate the bill that comes 30 days later, along with the subsequent monthly payment. Ouch! How Credit Cards Help You Land a Mortgage: Credit cards that are paid current with no derogatory items or delinquencies improve and support a good credit score, which reduces your borrowing costs. Mortgage lenders typically want to see a borrower carry at least three open trade lines (and credit cards are a common form of a trade line). Examples of this would be a line limit with a department store for example or even basic Visa credit card. 1. Credit cards are reported to the credit bureaus (sometimes just one or two bureaus), and are very beneficial to a credit score, assuming you have a perfect payment history. 2. Assuming you have no derogatory items or late payments, your credit card obligation can show a "pattern over time" of consistent satisfactory history. 3. If you carry no balances, this shows a lender that a person has "good character." 2. Multiple credit cards spread out with high balances and high payments limit your borrowing power because the minimum payment obligations are higher, thus reducing your potential allowed house payment. 4. Credit card charge-offs still reporting a balance on your credit report will need to be zeroed out in order for you to successfully fund your new home loan. This will negatively impact your credit score. However, the negative effect of having an outstanding debt compounds due to the additional costs of paying off the previous charged-off balances, in addition to the higher interest for the mortgage from the lower credit score. Don't have the funds to pay off the previous bad debt? Then the loan won't happen. Managing Credit Cards to Secure the Best Mortgage Terms: Because credit cards can either hinder or help your ability to get a mortgage, there is a fine line not to be crossed. The best scenario for your mortgage would be to have minimal or no credit card delinquencies of any kind in the past 12 months. Consumers are allowed to get their credit reports for free once a year from each of the three credit reporting agencies through AnnualCreditReport.com. You can also obtain your score using free credit score tools and services. (Credit.com offers a snapshot of your scores and a breakdown of your credit profile to help you determine what areas you need to work on.) Whether you use a free score or you buy one from a credit scoring service, know that the number you seemay differ somewhat from the score your mortgage lender will see, but it will nevertheless give you a helpful range to work within. Tim Gruber The New York Times Movers carry furniture into a newly built home in Otsego, Minn. The recovering housing market has sent land-hungry builders to suburbs like Otsego, located 30 miles from downtown Minneapolis, where new developments are bordered by cornfields. MINNEAPOLIS – A few months ago, Michael N. Felix's phone started ringing again after four years of silence. Felix is a land broker whose business dried up when the housing marketcrashed. But with home prices now rising faster than anyone expected, builders are again looking for what, in the land trade, is referred to as dirt. Already, developers report that the cost of land in the most desirable areas is double what it was two years ago. At least three golf courses in the Minneapolis-St. Paul area are being carved into millions of dollars' worth of residential lots. The race has even sent builders back to outer suburbs like Otsego, located 30 miles from downtown Minneapolis, where bulldozers are laying the groundwork for four-bedroom houses with three-car garages, in subdivisions that are bordered by cornfields. "Lot buyers and sellers!!!!!!!!" Felix's website reads. "It is time to get moving again….!" Or past time. The latest land rush is in full swing, as developers realize that they have failed to feed the zoning, permitting and platting pipeline, which can take months or years to turn raw fields into buildable lots. They are realizing another thing, too: They have been sorely missed. "For the first time, I've seen cities want to work to help figure it out, rather than doing us a favor all the time to let us develop," said Scott Carlston of Hunter Emerson, a development partnership. Hunter Emerson won a victory when the city of Eagan, a suburb of Minneapolis, allowed Parkview Golf Club to be converted into a high-end single-family subdivision. The hunt for dirt is not limited to the Twin Cities. After builders across the country spent decades feeding acre after acre of raw land into the maw of demand for single-family homes, the housing crash left them with a land surplus so large that lots were selling for pennies on the dollar. At the peak of supply, in 2009, there were enough lots to last almost eight years, according to MetroStudy, a firm that tracks housing data. Now there is less than four years' worth, and only about a quarter of that is in the more desirable A- or B-rated locations. "We have gone from a situation where five years ago everyone was saying, 'There's too many lots,' to today, builders are literally crying on our shoulder saying, 'There's not enough lots. We can't find any,'" said Bradley Hunter, the chief economist at MetroStudy. The shortage of lots is slowing the housing recovery, the National Association of Home Builderssaid last week. In August, 59 percent of builders surveyed reported that lot supply was low or very low, the association said. Housing is a critical driver for the economy, not just because of the jobs and supplies needed to build homes but also the appliances and furnishings that new occupants purchase. At the peak of the housing boom, builders were finishing more than 1.6 million single-family houses a year. That number plunged to less than half a million during the recession. This year, the industry is on track to complete more than 570,000 homes, still substantially below the level considered necessary to replace aging homes and provide for new households. A return to more normal rates of construction would substantially lift the economy's anemic growth rate of about 2 percent over the past year. Carlston said that some cities in the Twin Cities area had adjusted their rules to allow fewer parking spaces or smaller lots. Otsego has lowered some of its development fees and allowed a developer to change an approved plan so that a partly built town house project could be finished with more salable detached homes. Rick Packer, a land development manager for Centra Homes, said some suburbs were relaxing requirements that homes be made of brick or stucco. Even the Sierra Club, which once placed Minneapolis among the top 10 sprawl-threatened cities, has backed off a bit. An annual bike ride by the local chapter, once known as the "Tour de Sprawl," has been given a less pejorative name and refocused to include not just threatened green space but what the group considers model development and transportation projects. Mayor Mike Maguire of Eagan, a co-chairman of the Regional Council of Mayors Housing Initiative, said one reason his city had approved a land-use change for the golf course was that so little new housing was built in the past few years. "When there's no new development, you have stock that's increasingly out of date and that tends to bring your home values down," he said. "That was one of the things we were hearing back from Realtors, was they had people who wanted to move to Eagan but couldn't find the home they wanted." In 2012, Hunter Emerson agreed to pay $8.6 million for the golf course, wagering that the city would approve the land use change. The partnership sold the property to a national home builder for $13.1 million, Carlston said. The houses built on it will cost from $400,000 to $700,000, he said. The excess left from the boom – land in various stages of development ranging from untouched to what builders call PVC farms, named for the hard plastic plumbing pipes that, with electrical lines, were virtually all that was on the lots – is quickly being absorbed. Developers have gone from buying foreclosed acreage from banks to buying from farmers, family trusts, manufacturers and even homeowners with outdated homes on single lots. "What we've seen is the inner ring of the suburbs, all those areas have come back," said Rod Just of Key Land Homes, a Twin Cities builder. "The outer ring, they've taken just a little bit longer because of gas prices, but they're going to come back." WASHINGTON — Americans cut back sharply in July on their purchases of new homes, a sign that higher mortgage rates may slow the housing recovery. U.S. sales of newly built homes dropped 13.4 percent to a seasonally adjusted annual rate of 394,000, the Commerce Department said Friday. That's the lowest in nine months. And sales fell from a rate of 455,000 in June, which was revised down from a previously reported 497,000. The housing rebound that began last year has helped drive economic growth and create more construction jobs. But mortgage rates have climbed a full percentage point since May. The increase has begun to steal some momentum from the market. Sales of new homes are still up 7 percent in the 12 months ending in July. Yet the annual pace remains well below the 700,000 that is consistent with a healthy market. July's drop "may mark an uh-oh kind of moment for the housing recovery," said Mark Vitner, an economist at Wells Fargo Securities. Homebuilder stocks declined sharply Friday, even as overall market indexes rose. Shares of Toll Brothers Inc., D.R. Horton Inc. and Lennar Corp. — three of the nation's largest builders — all fell more than 3 percent in afternoon trading. And major homebuilders' shares have been dropping steadily since late May. The slide began after Federal Reserve Chairman Ben Bernanke first signaled that the Fed might reduce its bond purchases later this year. The bond purchases have helped keep mortgage rates and other borrowing costs low. The average rate on a 30-year mortgage reached 4.58 percent this week, according to Freddie Mac. That's up from 3.35 percent in early May and the highest in two years. The impact on would-be buyers' finances is significant. Take someone who locked in the early May rate on a $200,000 mortgage. They would have a monthly payment of around $875. But the same mortgage at last week's average rate would cost $1,025 a month. The difference adds up to $150 more each month — or $54,000 over the lifetime of a 30-year loan. The monthly figures don't include taxes, insurance or initial down payments. Potential buyers appear to have noticed that financing a home purchase has become more expensive. 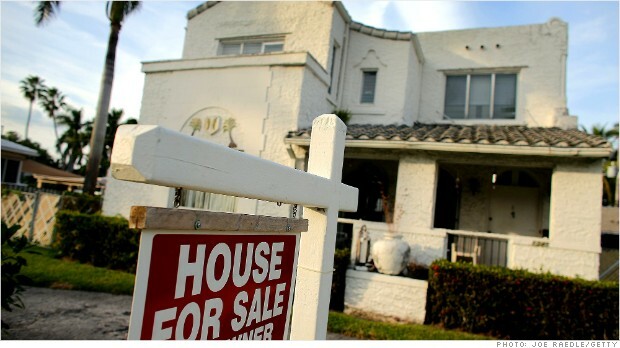 The number of Americans applying for mortgages to buy homes has plummeted 16 percent since the end of April. And builders began work on the fewest single-family homes in eight months in July. Still, mortgage rates remain low by historical standards. The same $200,000 loan would cost a buyer $1,330 a month at a 7 percent rate, the average since 1985. Most economists expect the housing recovery will continue, albeit at a slower pace. "We've been spoiled by low rates," Greg McBride, senior financial analyst at Bankrate.com. "People are gnashing their teeth now over a rate we had never seen four years ago." He notes that, based on their figures dating back to 1985, rates on the 30-year loan had never sunk below 5 percent until 2010. The impact of higher mortgage rates has surfaced in the new-home market faster than the re-sale market because the new-home sales are measured when contracts are signed. Higher rates may have also caused potential buyers to cancel some purchases of new homes. Vitner says that may explain why sales were revised down in May and June. Most of the revisions occurred in sales of homes not yet under construction. Buyers don't need mortgages until construction begins. Sales of previously occupied homes reached a nearly four-year high last month. But that report measured completed sales, which typically reflects mortgage rates locked in a month or two earlier. The jump likely reflected a rush by home buyers to lock in lower rates. Next week, a measure of contract signings in July will be released. Many economists expect that will drop. Fed officials are closely watching the impact of higher mortgage rates on the housing recovery. The drop in sales could strengthen the hand of those Fed members who want to delay reducing the bond purchases. "The spike in mortgage rates is slowing the pace of improvement," Dan Greenhaus, chief global strategist for BTIG, an institutional brokerage, said in an email. "Given the speed at which housing was improving, and the growing talk of a renewed bubble, some moderation, assuming it doesn't materially worsen, is not a terrible outcome." A housing development proposed for a former tomato cannery in Davis could be the last subdivision built in the university town, provided it can overcome the city's powerful anti-growth streak. As planned, The Cannery project would include a 7-acre organic farm, a "market hall" filled with small eateries and artisan food vendors, a 2-mile bike loop and 547 apartments and single-family homes of varied types and sizes on roughly 100 acres. Food giant ConAgra, which owns the property, is working with The New Home Co., a housing developer, to advance the project. The Davis Planning Commission and City Council are scheduled to take it up in a series of hearings in September and October. Regional planners say The Cannery could serve as a model for future development across the greater Sacramento region. "It really hits a lot of the marks in terms of the general principles of our Blueprint," said Mike McKeever, executive director of the Sacramento Area Council of Governments, the region's transportation planning agency. The Blueprint is SACOG's long-range plan that promotes compact, mixed-use development near jobs and public transportation. The University of California, Davis, is expected to be one of the region's main job generators in the coming years – both in terms of direct employment and related businesses such as biotech, McKeever said. Davis, he said, needs more types of housing to accommodate young professionals, families and seniors. According to SACOG, Davis needs to plan for more than 1,000 new homes by 2021 to meet its obligations under state law to house its share of the region's growing population. Plans for The Cannery call for a variety of housing types at different price points, including 2,100- to 3,500-square-foot family homes and more-compact houses with small second units above the garage. Also part of the mix are row homes, low-income apartments and upscale "stacked flats" with elevator service intended to appeal to seniors. Housing in Davis has become increasingly expensive and scarce since new construction stopped because of resident opposition and the recession. Enrollment in the local schools has been declining over the past decade. UC Davis is building a neighborhood for faculty, students and staff on land it owns in unincorporated Yolo County, but it is only for those affiliated with the university. The site of the former Hunt-Wesson cannery, about 2 miles from the main campus, is the last large parcel in Davis not zoned for agriculture or open space. That means it can be developed without a vote by Davis residents who, under the terms of a ballot measure first passed in 2000, must approve the rezoning of farmland for housing. The ordinance, commonly referred to as Measure J, is unique in the Sacramento region. Only a handful of communities in the state have similar provisions; most of the others are in wealthy, coastal enclaves. The Davis measure was renewed in 2010 as Measure R. It passed overwhelmingly, and it is expected to be renewed again in 2020. Under Measure J, Davis voters defeated two subdivisions requiring votes in the past decade. In 2005 they shot down Covell Village, which proposed nearly 1,900 housing units and retail shops on about 400 acres of farmland beyond the city's northern boundary. The project lost by a vote of 60 percent to 40 percent. In 2009, by a 3-to-1 ratio, they defeated a much smaller project called Wildhorse Ranch. It proposed 191 homes on the site of a 26-acre horse farm. After the last development lost by a large margin – 75 percent to 25 percent – some developers and residents said Davis would never grow beyond its current boundaries as long as voters had their say. The Cannery is an infill project that requires only City Council approval. Still, some residents are already vowing a fight at the ballot box, either by persuading council members to put it to a popular vote or by using the initiative process to force an election. "If the council won't put it on the ballot, some Davis residents will put it on the ballot," said lawyer Michael Harrington, who said he thinks the land should remain zoned for commercial or industrial use. Some say letting voters decide the fate of The Cannery would undermine the the purpose of Measure J, which was meant to protect farmland, not to require votes on infill development. "The point is it shouldn't go to a vote because it isn't part of Measure J," said Eileen Samitz, a former Davis planning commissioner who championed the ballot measure and opposed prior developments on farmland. "It would be a misuse and could endanger the future of Measure J." The Cannery's potential to accommodate new housing was used as an argument against both Covell Village and Wildhorse Ranch. Building it would largely fulfill the city's future growth needs, Samitz said. "It's become a beautiful project which has had an enormous amount of community input," she said. "Now is the time to move forward." Evidence of a resurging real estate market is evident on the shores of Lake Tahoe, where premium-priced, high-end properties are moving. Sierra Sotheby's International Realty's Lexi Cerretti recently closed her third lakefront home sale in Lake Tahoe this summer, with the sale prices at $11.8 million, $6.2 million and $5.3 million. Sierra Sotheby's said lakefront sales in Incline Village and Crystal Bay have stepped up, with 11 lakefront homes and lakefront condos sold this year. Another half-dozen currently are pending sale. By comparison, there were only 10 lakefront home and condo sales in all of 2012. "Many high net-worth buyers are looking to either establish residency in Nevada or purchase second homes with plans to transition up to Lake Tahoe in the future from California," Cerretti said. One-third of Rancho Murieta has changed hands in a massive land sale by the union pension fund that developed the still-unfinished community 40 years ago in rural easternSacramento County. A group led by current homeowners paid an undisclosed price for 1,200 acres at Rancho Murieta, including the two 18-hole golf courses and more than 700 acres of undeveloped land that's being eyed for hundreds of additional houses. The deal, which closed Friday, is the latest chapter in the occasionally turbulent history of the isolated slice of suburbia 20 miles southeast of Sacramento along Highway 16. Four decades after it was founded, the county's first master-planned community has only about 2,500 homes – half as many as originally planned. Part of the problem was unstable ownership; during the 1980s and early '90s, Rancho Murieta was controlled by a swashbuckling Yolo County agribusinessman who lost the property to foreclosure. "People who live here love it," said John Sullivan, a Rancho Murieta homeowner and leader of the group that just made the big purchase. "We've had our turmoils in the past and it's our mission … to finish the job." Sullivan's group wants to build hundreds of homes on the property. He also plans to build an 83-room hotel and other amenities on a separate parcel that he and other investors bought last year near the community's gas station on Highway 16. The hotel, expected to cost around $12 million, would serve visitors to Rancho Murieta's equestrian center, Sullivan said. "The closest hotel is 14 miles away – we're looking forward to getting that hotel finished as quickly as we can," he said. The purchase serves as further evidence of recovery in the area's housing market, said Greg Paquin of the Gregory Group, a Folsom real estate consultant. "Clearly that's part of the message – the market's good," Paquin said. Sullivan said his group includes the owners of the equestrian center. Sullivan has been involved in various leadership roles at Rancho Murieta for years and is associated with two development firms, Cosumnes River Land and Lone Pine Investments. The housing and the hotel would require approval from the Sacramento County Board of Supervisors. The housing project is probably two years away from securing approval, while the hotel proposal is much further along. The county approved more than 600 new homes on different parcels at Rancho Murieta before thehousing market collapsed in 2007. Those plans are still pending, with permits held by several different developers. Those 2007 approvals were controversial. The Environmental Protection Agency and other regulators questioned the potential loss of habitat. Some current residents were fiercely opposed, saying the new homes would violate earlier promises about open space. The group that bought the land Friday could propose a development plan that would meet with fewer objections. The 700 acres could handle 1,100 new homes, but Sullivan said "our plan is to be somewhat lower in the density. "The land is generally north of the Cosumnes River and east of the main entrance on Murieta Parkway. "Most of the investors have been residents for decades," Sullivan added. "We've been in Rancho Murieta since almost the beginning, one way or another." Rancho Murieta was developed by the pension trust fund of Operating Engineers Local 3, a major union based in the East Bay. The union has operated an apprenticeship training program at Rancho Murieta for years. Union trainees operating heavy machinery carved out the golf courses, man-made lakes and other features of the property. In 1985, the union pension fund sold the community to Jack Anderson, a highly successful tomato farmer from Davis. Anderson added Rancho Murieta to a growing portfolio that included 200,000 acres of farmland, the Dunes casino in Las Vegas and the gleaming "Emerald Tower" office building on Capitol Mall in Sacramento. The sale followed several years of litigation, in which Anderson claimed the pension fund had reneged on an earlier deal to sell him the property. In 1993, the pension fund took Rancho Murieta back. It foreclosed on the property after Anderson defaulted on a $27 million note, one in a series of defaults and other financial troubles that would bring his empire to ruin by the end of the 1990s. Officials with the union and its pension fund couldn't be reached for comment Tuesday. Ken Noack Jr., a Cornish and Carey Commercial broker who represented the pension fund in the sale, said he wasn't sure why the union wanted to unload the property. Noack said the union will lease about 50 acres back from the new owners to continue running the training center. "They'll be here for the foreseeable future," Sullivan said.